You wanna talk living legends? 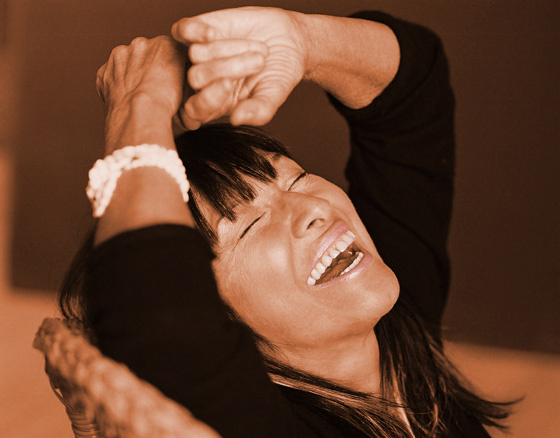 Buffy Sainte-Marie blazed through the Greenwich Village and Yorkville folk music scenes in the 1960s before embarking on a multi-decade musical, spiritual, political and educational journey that has seen her cultivate a groundbreaking musical career while raising consciousness around issues of ecology, pacifism and indigenous rights. Along the way she earned a PhD from the University of Massachusetts, was blacklisted by the U.S. government, experimented with EDM long before there was a thing called EDM, wrote one of the biggest hit songs of the 1980s ("Up Where We Belong") and became perhaps the first woman to breastfeed her baby on American TV. Beat that. Born on a Piapot Cree Reserve in Saskatchewan's Qu'Appelle Valley, and raised by adoptive parents in Massachusetts, Sainte-Marie developed a distinct perspective on nationalism, violence, feminism and racial politics that has informed her work ever since. As renowned for her incisive songwriting as for her inimitable vocals, Sainte-Marie inspired countless artists of her generation, from Joni Mitchell to Bob Dylan to Bobby Bare to Janis Joplin, and remains a major touchstone for any act looking to blend political awareness with artistic expression. Her latest album, Power in the Blood, might be her best recorded work since the mid-'60s — this living legend's about to find herself with a whole new generation of acolytes. Zipping around the world with my band, playing songs from Power in the Blood — drummer Mike Bruyere from Winnipeg and Vancouver; bass player Mark Olexon from Vancouver; keyboard player Kibwe Thomas from Toronto; guitarist Anthony King from Los Angeles; and our tour manager Denton Frazer from Toronto. Just back from Australia, Wales, Ireland, Scotland and England — then across Canada, and now off to the U.S. Kinda busy but fun. Audible books! I'm a biblioholic but usually in motion so I listen while doing other things — gardening, cleaning house, in the tour van, flying around in planes, in bed. I have over 600 audible books. Current faves: The Absolutely True Diary of a Part-Time Indian by Sherman Alexie; Revolution by Russell Brand; 1491: New Revelations of the Americas Before Columbus by Charles Mann; This Changes Everything: Capitalism vs. the Climate by Naomi Klein; The Signature of All Things: A Novel by Elizabeth Gilbert; Hit Men: Power Brokers and Fast Money Inside the Music Business: Fredric Dannen. I live on a farm in the mountains of Hawaii, in the middle of the Pacific Ocean, six hours by plane from North America. Just trying to hide from le show biz. Sgt Pepper's Lonely Hearts Club Band, made on a four-track tape recorder. Although I was into technology very early and still value having great stuff with which to record art, it has always been about what you actually do with the technology. Sgt Pepper continues to prove that it's always about the music, not the hype. For the Smithsonian's 150-year anniversary, we played a concert for a million people in Washington, DC. There were only three bands: Aretha Franklin, Trisha Yearwood and us. Wowww! Big crowd. Thumbs up: Having my Academy Award on display at the Smithsonian. Thumbs down: A 27-hour trip last month from Australia through Hong Kong to London. Cathay Pacific charged me $1,345 for one suitcase and a guitar. Argghh. Never again. Nothing. Please blabber on. I always learn something. I like that I love to learn and do ballet and flamenco. I hate that I'm annoying, always bragging about loving to learn and doing ballet and flamenco. Sleep till I just can't sleep no more. Don't ever sign away your publishing rights for one dollar via a contract on the back of a napkin. Yep, I really did. Nope, never have done that. N a t u r a l b e a u t y.
Elvis Presley. It was his first record, featured "Hound Dog," "Money Honey," "Heartbreak Hotel." As a teenager, he was the best. I've only had three day jobs, all while I was a teenager: At age 14 I was the worst waitress ever, for a week; at 15 I sold cosmetics at a little drug store one summer; then at 16, I worked as a counter girl in a fantastic bakery that used real ingredients. A bath, an audio book, and a very long nap...with a kitty cat. Dreaming of playing music. It's been my best friend and playmate all my life. No lessons: the emphasis is on play. Not much actually, although trying to do a great concert with a 12-hour jetlag is a nightmare asleep and awake. Just about anything... but I usually restrain myself. The one that never happened. I had a big crush on Jet Li (Romeo Must Die, with Aaliyah). He was reportedly in the lobby of the hotel where I was staying, but I was too star struck to go down and see. Then I figured out that mostly I like leaving my heroes up there on the screen. Billy Gibbons of ZZ Top. Anything he wanted. My late Mom witnessed me at age three discovering the piano. She knew I had found my lifelong partner and true satisfaction, success or not. She was always happy for me. "Dance Hard Intertribal" by Northern Cree.